Type II Type IV ??? Here is a 10c Jefferson Stamp. There are a few versions, some more valuable than others. What Do You Look For? The first step in identifing this stamp is by first looking at the top right scrolls. Is there any marks inside the scroll? Is the paper "soft porous" or "hard paper"? Soft Porous paper is less transparent than hard paper. When held to the light it ususally appears mottled, like newsprint. Hello Lost. This is a great question. Please note this Washington issue is identified in a few different ways. The most obvious is the text: "TWO CENTS". Now that we know that much, the next step is to measure the perforation, first the top, from left to right; then the right side, from top to bottom. Perforations are key. Is the perforations all-around the stamp? Maybe the perforations lie on it's top and bottom (vert. perf), left/right edge (hortz. perf), or no perf at all (imperf). Look at the images below to help you identify your perf style. After you have sorted your stamps into one of the above perforation styles, all you need to do is a watermark test. A watermark test is where you apply a special watermarking fluid to the back of your stamp.... if there is a watermark in your stamp, you will see what appears to be a reverse image of the letters U S P S.
Look at the stamp above (Image A). You see a clear, reverse image of a double line watermark. Some times your watermark is not so clear. Look to the single line watermark image (Image B). You may get a stamp that has very little watermarking on your stamp. You must have patience, because this simple test could make your stamp more valuable than you know. This stamp we are researching could have a double line, a single line, or nothing at all. After you sort you stamps once more, the work is done. Look at the follwoing table and see which stamp you have. There is a line of color between the letters "P" and "O" of "Postage." There is a strong line defining the curve of Washington's nose. Washington has a clear double chin. The inner frame of the portrait appears solid and unbroken from the toga to the hair braid. The top line of the toga rope and button are strong, but the fifth diagonal line is missing. The letters "P" and "O" of "Postage" are joined. The shading lines of Washington's hair are heavy at top. Washington's nose is not clearly defined. The lines in Washington's chin have been slightly softened. The inner frame of the portrait does not have a clear line of color separating it from design elements. The top line of the toga, the button and all diagonal lines are clear. Thare is a heavy, downward sloping line on Washington's mouth. The horizontal line in the left numeral "2" is weak and almost always broken. There was some distortion while creating the negative for these stamps, thus the design is not quite uniform. The width of the top portion of the design measures about .745 inches. The bottom, at .740, is slightly narrower. All designe element characteristics are virtually identical to those of Type V, except the nose. There is a missing dot in the fifth row. The horizontal line in the left numeral "2" is extremely thick and dark. Numerous shading dots have been added to the top of Washington's head. There are four horizontal rows of three dots on the upper lip. The horizontal line of the left "2" is solid, but not as heavy as on Type VI. There are fewer dots and lines in the ribbons and laurel leaves than all other types. 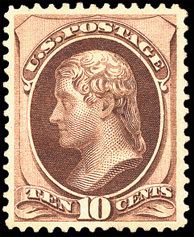 There is an overall light appearance to these stamps, with a lack of detail in hair shading. The top line of the toga rope is usually incomplete and the fifth diagonal line is missing.